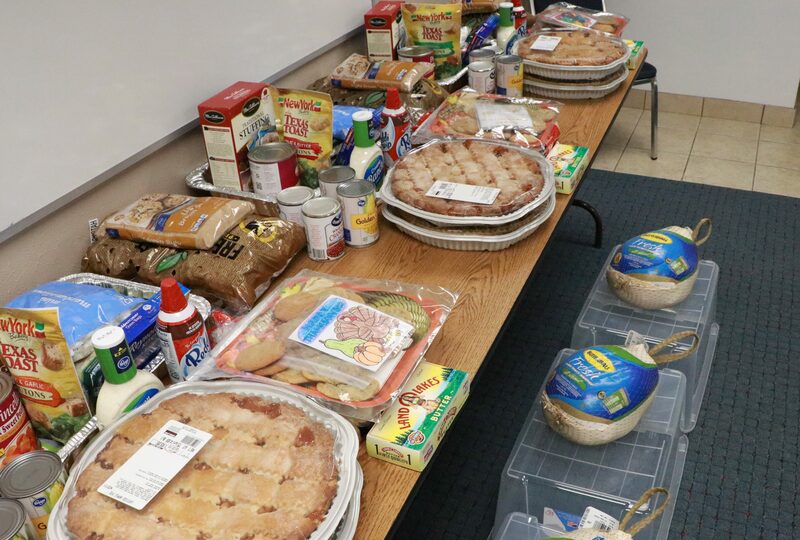 ST. GEORGE — Students at Cinnamon Hills Youth Crisis Center got an early taste of Thanksgiving cheer when they packaged and delivered complete turkey meals to several local families in need. Cinnamon Hills, a licensed and accredited boarding school and treatment center, is home to nearly 100 at-risk students between the ages of 12 and 18. Approximately two-thirds of the students are male, and most of the school’s students are from California, center officials said. Ryan Finck, the center’s manager of student needs and services, accompanied several of the students in delivering the food Monday and Tuesday afternoon. Students in the second level of the program at Cinnamon Hills – the “life skills” level – can earn the opportunity to go off-campus once each week, Finck said. Finck said at Cinnamon Hills, they like to change lives for the better. The meals were taken to several area families who’d been recommended for assistance by local church clergy, and several students shared Finck’s sentiments Tuesday afternoon as they filled the containers with food items in preparation for their delivery. “I felt good helping others because it was something that happened to me when I was younger,” said one female student, whose name has been withheld in accordance with Cinnamon Hills policy. “I’m thankful for the opportunity to be able to give back to our community,” another girl said. Another teenage student said the experience gave her a better sense of appreciation. “Now I can remember to be less selfish because there are people less fortunate than me,” she said. 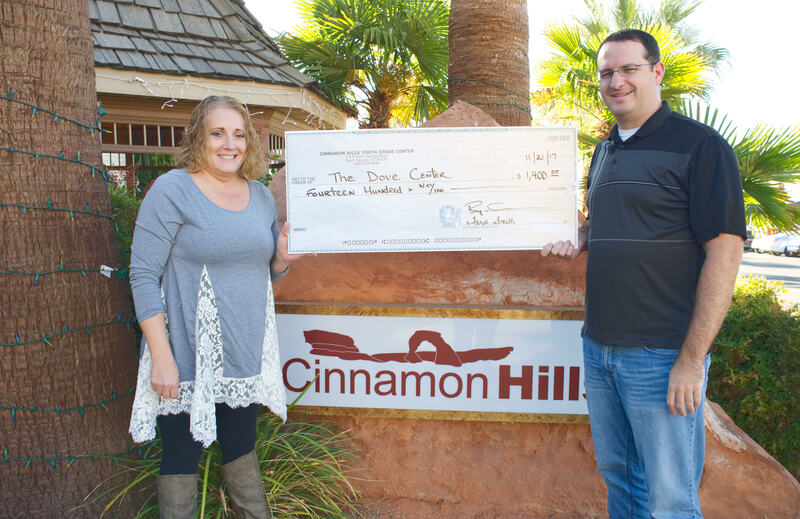 Cinnamon Hills staff members also helped out this year by making a donation to the Dove Center, a local shelter that assists victims of domestic violence and sexual abuse. 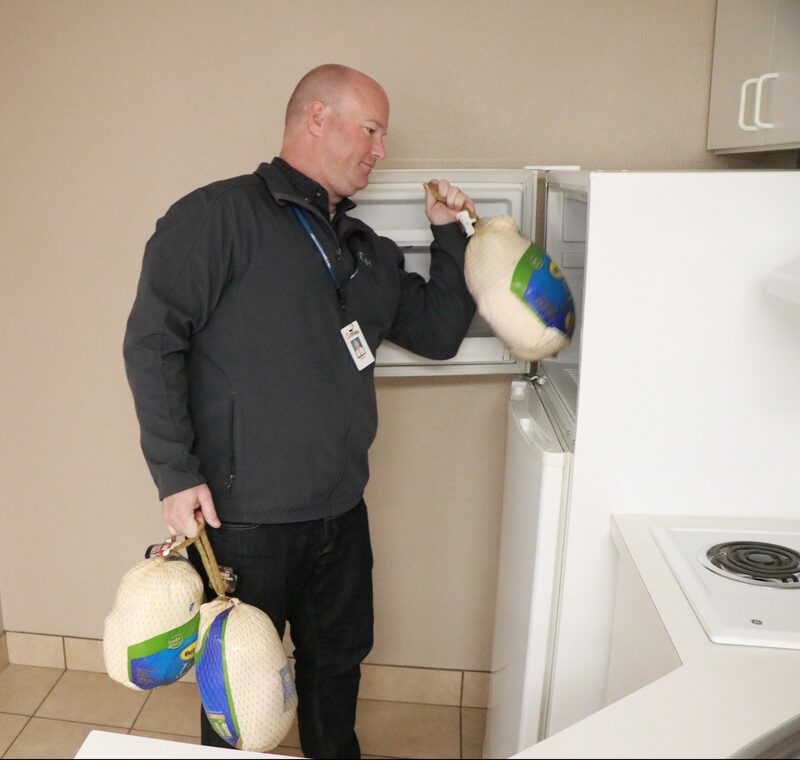 “We have provided our staff with a free Thanksgiving turkey for many years, but a few years ago we began giving our employees the option to donate their turkey to a charitable cause,” Cinnamon Hills program administrator Ben Nickle said. Nickle said the donation was made possible in large part by the generosity of Cinnamon Hills CEO Buff Williams and the Williams family, who have been managing the center for more than 20 years and provide the turkeys. Nickle delivered the check to the Dove Center Wednesday afternoon. Students and staff alike will cap off their holiday week Thursday by feasting on a Thanksgiving Day meal, joined by a few of the students’ parents and other family members. Nickle said he often sees students change their perspective and attitudes while enrolled at Cinnamon Hills. Nickle said hearing students give thanks for the role Cinnamon Hills has had in their lives is “real proof” of that change of attitude and perspective. Changing a life for the better takes a lot of effort, but changing it while someone is still young enough to have so many good years ahead is a wonderful feeling.